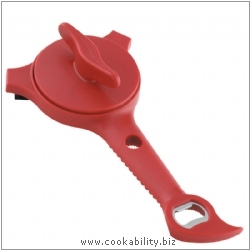 Five Functions Include: Jar Lids: Fits jar lids from 2.5-9cm. Church Key: the classic bottle opener. Screw Tops: Place the eye over plastic bottle lids and twist counter clockwise to open. Pull Tabs: Slide end under loop of can tab, hold can firmly and lift up and forward. Use small eye for small bottles.